I quick drawing I did right in photoshop and I added some effects in painter. 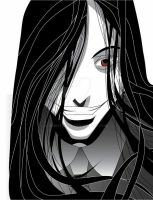 Alucard is one hot vampire bishy! Wow, now I know you're awesome if you like Arucard! OMG, you better send me picts of the costume! ^_^ Sw33t! I'll be sure to post them on here to stay tune! Hey dude, shouldn't you be sleepin'? It's midnight here! 0_0 Sleeeeeeeep is GOOD! wooooooooooowwwww that is really cool!!!!! alucard is very very awesome. Thank you and GOd of course is he awsome!! I'm cosplaying as him next year!